These nitrous kits are designed to mount directly to your handle bars so that you never have to remove your hands from the grips as you trigger the nitrous. You can rotate your handle bars completely from one side to the next. 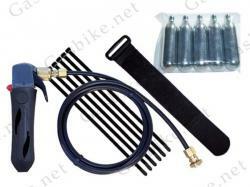 All kits come with high quality brass fittings, custom made velcro strap and over sized 1/4 ID Hose. The NOS dispenser is secured with a velcro strap. This allows you to easily refill your nitrous chargers as needed. The nitrous hose mounts directly into your intake system thru the airbox, air filter, intake manifold or thru the rear of your boost bottle with the fittings supplied.